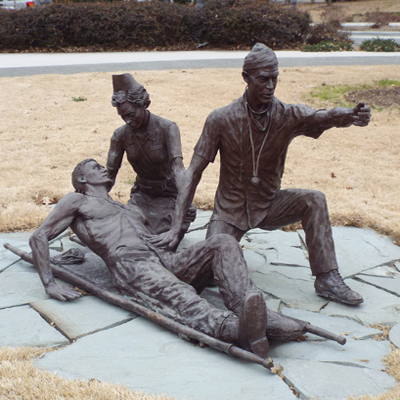 The memorial features four life-size figures -- an injured soldier, a physician, a nurse and a corpsman. The soldier appears to be trying to rise from the stretcher he is lying on while attended by the nurse. 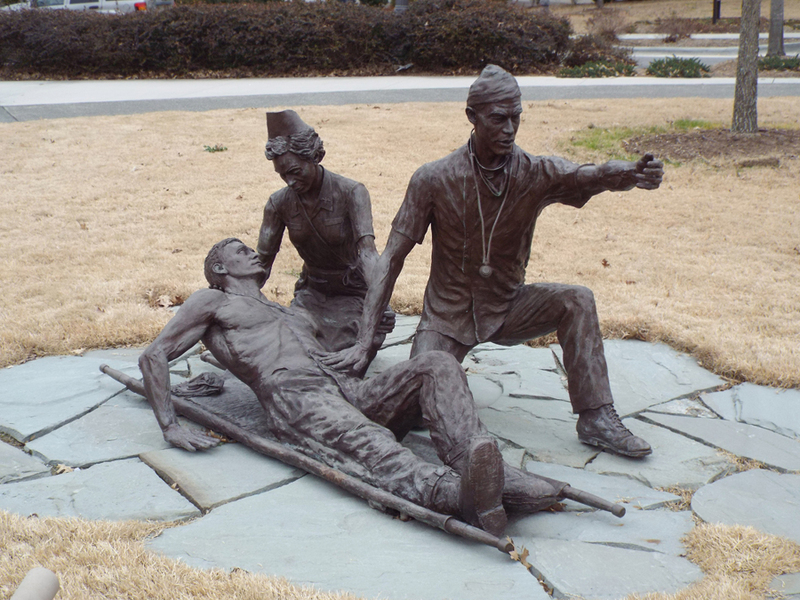 The doctor, dressed in surgical garb, is trying to hold the soldier down with his proper right hand while he beckons with his left hand towards the corpsman sculpture which is positioned 15 to 20 feet away. The corpsman is running towards the doctor, nurse and soldier. The sculptures are resting on a base of shale paving stones. A bronze plaque near the corpsman contains the inscription. The dedication ceremony featured recollections of the 65 th General Hospital by its historian, retired Duke Professor of Surgery, Ivan W. Brown, Jr., MD and a keynote address by Brigadier General Eric B. Schoomaker, MD, commanding general of the Southeast Regional Medical Command. The sculpture was presented by R. Sanders Williams, MD, Dean of the Duke University School of Medicine. Music throughout the ceremony was provided by the 82nd Airborne Division Band from Ft. Bragg. The dedication also marked the 55th and final reunion of veterans of the 65th General Hospital. In February 1944 the 65th General Hospital was ordered to Botesdale, Suffolk in England. This hospital was located in the heart of a number of air bases serving the American 8th Airforce. In nearly daily raids over Europe as many as 10,000 men and 1,000 planes were involved. Casualties caused by anti-aircraft fire, cannon fire and bullets from German planes, crashes and accidents were numerous. The 65th acted as an evacuation hospital receiving freshly wounded causalities directly from the aircraft and as a General Hospital serving troops stationed in the area. After the D-Day Invasion it received trains with up to 600 casualties each, transferred from evacuation and field hospitals on the continent. During the 22 months it was in service the hospital served 17,250 bed patients. In 1992 a memorial to the unit was placed at the hospital site in England. The memorial was sponsored by George L. Stebbings of Suffolk who as a boy of 14 had befriended the doctors and nurses in the unit. In 2002 he was named an honorary alumnus of the Duke University School of Medicine. The sculptor Stephen H. Smith, a graduate of the University of North Carolina, also created the statue of Benjamin N. Duke that stands on a pedestal on Duke University's East Campus, First Flight Centennial Memorial in Kill Devil Hills, Martin Luther King, Jr. statue in Fayetteville and the James K. Polk statue in the rotunda of the Morehead Planetarium on the University of North Carolina campus. The sculpture stands on a lot adjacent to Duke Clinic in Durham, NC, at 40 Duke Medical Circle. Behind it is the Duke LifeFlight Helicopter pad, where critically ill and injured patients are airlifted to Duke from across the region. The memorial stands on a lawn, surrounded by trees.